One of my favourite websites for skincare products is UK-based Bath & Unwind - they ship worldwide tracked for free, and have some hard-to-find brands apart from the usual suspects. I was thrilled to receive an email saying they were coming out with beauty boxes - the first one was offered as a gift with purchase if you shopped for £50, with code BAUBOX. The products in the beauty box were revealed beforehand, and I knew I wanted everything. I picked up some First Aid Beauty and Korres products until my bill ran to £80, and got the box absolutely free! The box as such is not much to write home about; it is just a brown cardboard box. But the contents, despite being skincare-only, have had me more excited about a beauty box than I have been in a long time (apart from the time I got Too Faced Melted in an Ipsy bag). 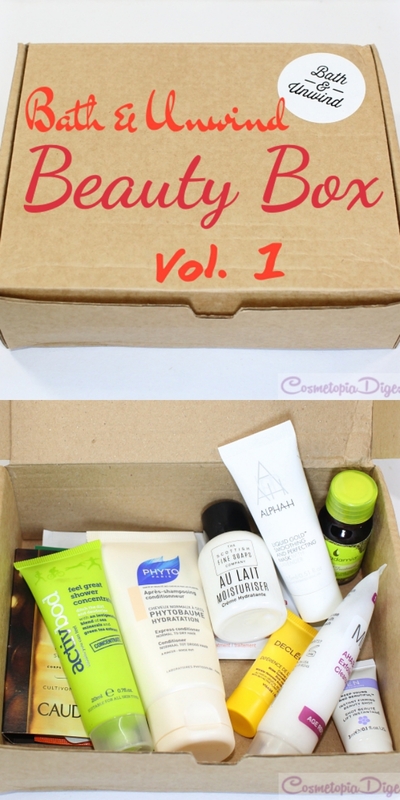 Check out the contents of the first Bath & Unwind beauty box below. Inside, you get a product card, and everything is nicely wrapped in tissue. Most products are decent travel sizes, with a couple of foil sachets coming in. The deluxe/travel samples are all fabulous choices and will definitely be used. I have been wanting to try several of those for a while now - especially the Liquid Gold Mask and the Scottish Fine Soaps Moisturiser. The Phyto condish smells like vanilla fudge! I have loved everything I have tried from Phyto so far. That brand is always kind to my hair. I am pleased to get the Caudalie Huile Divine. I am a huge fan of Nuxe dry oil and want to know if this one is as good. What I did not want to receive was the bre@st push-up cream. It was only a foil sachet, but still... not in a beauty box. I am really happy with this box and cannot wait until they come out with a second edition. They have said this box is "June 2015", but I got this only in July. I hope the price is decent, because it looks like this will be a regular box, and that there is some makeup once in a while. I would also like to see those foil sachets go. Even without those, this box is attractive enough. Also, no breast push-up creams, please. I would rather have another face wash sachet instead. Value for money? This one definitely was. I already bought First Aid Beauty eye and skin care products and Korres hair pack, and got the box as a freebie. The value of the box is estimated at £60 but it is not for sale and you can only get it as a gift with purchase until stocks last. You can buy the box - and other things - here. Have you tried anything you see here? How did you like it?